Fore here, at prices just above Buick's lowest, you can command the mightiest engine Buick ever built -- 236 V8 horsepower. 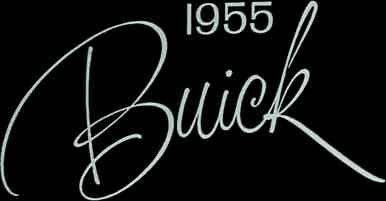 And harnessed to this power is Buick's most compact and maneuverable wheelbase of 122 inches. So you get a high power to low weight ratio that spells electrifying performance in getaway, in passing, in hill climbing, in every phase of driving. And the thrills are doubled with new Variable Pitch Dynaflow. Stretching out under this tremendous power is a ride of infinite smoothness. Over it, longer, lower beauty in every model. Sedan, Riviera, Convertible and all-steel Estate Wagon -- each has rakish new sports-car styling. Each is now distinguished by four fender ports. Truly, when you make the 1955 CENTURY your choice, you've selected the car that's styled and powered and priced to thrill you with all its might.